QA Graphics, a full-service digital design company, recently worked with Timeless Columbaria to create a motion graphics video for their 21-foot Eternal Fan Piston statue. This statue is the first of its kind to be unveiled at any sports venue. It made its debut earlier this fall at the Richmond Raceway in Richmond, Virginia. 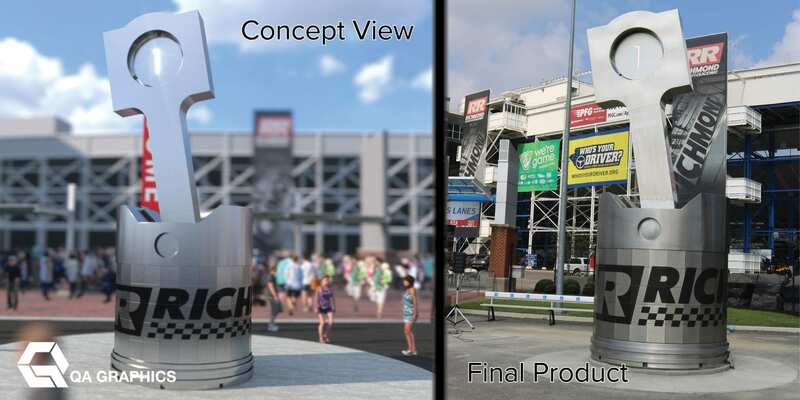 Our 3D team created a graphics video that showcased a virtual Richmond Raceway environment, including the Piston Statue coming to Virginia: http://bit.ly/TCrrp The highlighted piece contains one of the 125 individual sections for fans to purchase, securing their favorite raceway memories for future generations. QA Graphics was honored to bring Timeless Columbaria’s vision to life with a video message to capture the audience’s attention. “The world’s largest Eternal Fan Piston will truly be a sight to behold as fans walk through the Midway and make their way inside the track,” said Richmond President Dennis Bickmeier, in a recent article with ESPN. View this press release online HERE.